Prime Minister Narendra Modi, who is on a two-day visit to Spain, said on 31 may that issues such as terrorism, economic ties and global developments between allied countries will be discussed during meetings with Spanish Prime Minister Mariano Rajoy. Prime Minister Modi said cooperation in railways expansion and upgradation ,smart cities, infrastructure, etc are areas of India's priorities and requirements where Spain has enough skills and mastery in such fields. He added, "With a mission of promoting my vision of "New India", this visit will bring a new momentum in the ties of India with Spain by giving fresh impetus to a multifarious relation." Applauding economic reforms undertaken by Spanish government, PM Modi said, "Under President Rajoy's leadership, Spain has undergone economic reforms and economic growth and development is also the biggest priority for my government and this era belongs to transformation and close ties with Spain will take both of us to a new direction." Describing terrorism as a global threat, Modi said "Both our countries have faced terrorism and strengthening cooperation on this security challenge is an important part for bilateral agenda. Terrorism is a challenge for all of our societies,we get to hear a lot about terror attacks these days." 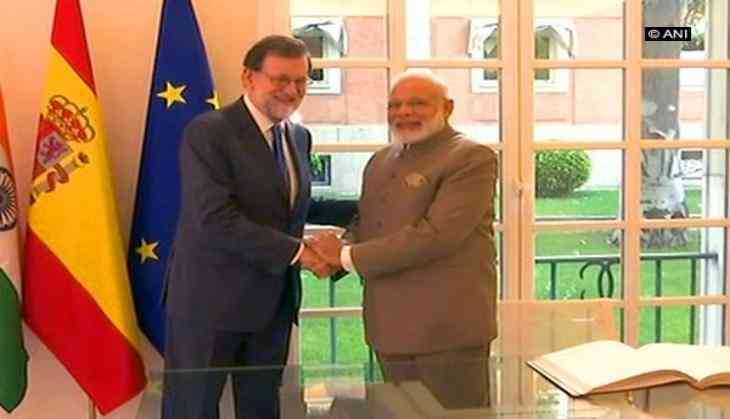 Modi said,"I am sure the discussions with Prime Minister Mariano Rajoy will lead to enhancement of India-Spain bilateral ties and We are in favour of making ties with Spain even more productive in the coming years." Prime Minister Modi said apart from bilateral relations, global developments between allied countries are important in today's global context. Modi is on a two-day state visit to Spain. He arrived in Madrid on 30 may. During his visit, several agreements are likely to be inked. They include renewable energy, high speed rail, infrastructure, civil aviation, water waste management and air space management.